Note this is a Box of 50 cartridges, not 20 cartridge like many others brands. Please note: Single cartridges available ,please see related items below. History of the 44-40 cartridge: The .44-40 Winchester, originally called .44 Winchester, and also .44 WCF (Winchester Center Fire) and .44 Largo (in some countries) is known as “the cartridge that won the West,” as it was a favorite of that era because it could be used in both revolvers and rifles of the day. The .44-40 was the first metallic center-fire cartridge manufactured by Winchester. The .44-40, which is short for .44 caliber, was loaded (at the time), with 40 grains of black powder and was introduced in 1873 by the Winchester WRA for the Winchester Repeating Arms Model 1873 lever-action rifle and used in the 1878 Colt revolver. From then on many rifle and revolver companies chambered this great historical caliber. Although not used a lot as a military cartridge in the USA, the .44-40 was a military cartridge in other counties and even Great Britain purchased 20,000 Winchester lever-action model 1892 chambered in .44-40 for the Royal Navy. 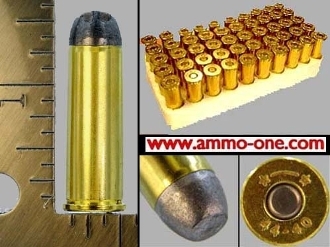 By 1942 more modern cartridges replaced the .44-40, but it regained some interest in the 1950s and 1960s when Colt again offered the chambering in the single action Army and Frontier. Now the .44-40 has enjoyed an increase in popularity due to cowboy action shooting. This is one of the most historical cartridges known today.